This unit was not present in the Army of the Lower Rhine but is typical of the regular Prussian units therein. It has 4 stands of 8 models making it 32 models equivalent to 640 men, A good size for a fresh Prussian regular battalion.It was known as the 1st West Prussian Regiment. 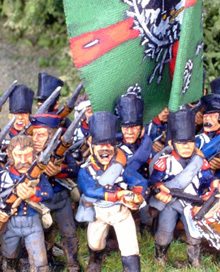 Models are Foundry painted by BH and in the collection of Adrian Howe. Donnybrook can now be bought for PCs and tablets. In the shop from today.